I was having trouble adjusting to my OM28. Great guitar, but I’m more used to a short scale triple 000. 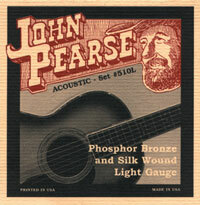 On a whim I put on a set of John Pearse 510 Bronze and Silk and the lighter tension and softer feel made this my go-to guitar. There is a slight loss in volume, but what you pick up in playability more than off sets that. And if you are plugged in there is no noticeable difference. Gentle strings, good for finger style. I have used these strings on and off for some years, alternating between Elixir. They are a gentle string, great for finger style and possibly for Gypsy Jazz. Not much use for heavy flat picking such as bluegrass. So if you like a softer warmer sound that responds well to finger style, these are excellent strings.